After several misses in his first sprints of the year, André Greipel (Lotto Soudal) finally opened his 2015 account when he won the bunch sprint on the final day of the Volta ao Algarve. Having been perfectly led out by Jurgen Roelandts, he held off Tom van Asbroeck (LottoNL-Jumbo) and Rüdiger Selig (Katusha) while Geraint Thomas (Sky) finished safely in the bunch to win the race overall. 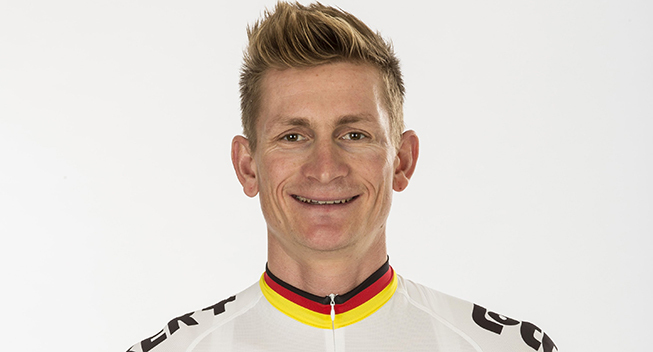 In the last few years, André Greipel has been the dominant sprinter in the first months of the road season as he has usually taken several wins at the Tour Down Under. To be fresher for the classics, however, the German has had a slower start to his 2015 season and he has raced less in the first part of the year and done less intensity training. This has had an effect on the results as the German both missed out on a win in the Challenge Mallorca and in the first sprint of the Volta ao Algarve. Today, however, he got the perfect confidence boost for next Sunday’s Kuurne-Brussels-Kuurne when he won the final stage of the Portuguese race. With a mostly flat route, the final day was always expected to be one for the sprinters but it turned out to be a complicated affair for the sprint teams to bring it back together. With less than 30km to go, a small 5-rider break with riders mostly from continental teams was dangling just 30 seconds ahead of the peloton and so the major teams were content to sit back and allow the small Louletano team to lead the chase. However, things got dangerous when the powerful Movistar duo of Adriano Malori and Jonathan Castroviejo suddenly bridged across with 25km to go, adding significant firepower to the break. This put the sprint team on the back foot as they suddenly had to work hard to bring back the 30-second gap. With 4km to go, the strong breakaway was still 18 seconds ahead but as more teams came to the fore, they started to lose ground. At the 3km to go mark, it had been reduced to 10 seconds and before the flamme rouge, it was all back together. This was the signal for the Lotto Soudal train to kick into action and the Belgians made a textbook lead-out to deliver Greipel to his first win of the year. The Belgian managed to hold off Tom van Asbroeck and Raymond Kreder while his lead-out man Jurgen Roelandts even managed to take 8th. Kreder was later relegated, meaning that Rüdiger Selig completed the podium. Geraint Thomas finished safely in the bunch and so he took the overall win with a 27-second advantage over Michal Kwiatkowski (Etixx-QucikStep). Tiago Machado (Katusha) made for some local representation on the podium as he was third at 1.11. Thomas also took the win in the points competition while Richie Porte (Sky) won the mountains jersey. Davide Formolo (Cannondale-Garmin) took a comfortable win in the youth competition while Katusha put three riders in the top 10 and won the teams classification. With the Volta ao Algarve done and dusted, the sprinters and classics riders will head to Belgium for the opening weekend while the GC riders will turn their attention to Paris-Nice and Tirreno-Adriatico. The enxt major race in Portugal will take place in August when it is time for the national tour Volta a Portugal. After three days for the GC riders, the sprinters were expected to be back in the spotlight on the final day of the Volta ao Algarve which brought the riders over 184.3km from Amodovar to Vilamoura. After a hilly first part with a single category 3 climb, the riders descended to the coast where they tackled a completely flat finale that should allow the fast finishers to show their legs. The riders took the start under a beautiful sunny sky but one rider failed to finish the race. Omar Fraile (Caja Rural) was the only rider not to sign in this morning while the rest of the peloton headed out on the final day of racing. As it is often the case for final stages, the pace was fast from the beginning as lots of attacks were launched but the situation was perfect for the sprint teams when Pawel Bernas (ActiveJet), Diego Rubio (Efapel) and Imanol Estevez (Murias Taldea) got clear already after 6km of racing. While the peloton slowed down, they built an advantage of 42 seconds at the 8.5km mark while Heiner Parra (Caja Rural) tried to bridge the gap. It was an impossible mission for the Colombian climber who fell pack to the peloton that continued to lose ground. At the 32km mark, they were 3.57 behind but now Caja Rural decided that they wanted to get back in the mix. With no sprinter in the team, they had missed the move and so started to chase. When Estevez led Bernas and Rubio over the top of the final climb of the race at the 61km mark, the gap had come down to 2.19 and now the Spanish team was accelerating. After 66km of racing, the escapees were only 1.02 ahead and 12km later, it was all back together. Bernas refused to give up and so he launched a new attack. This time Caja Rural were attentive and so he was joined by Lluis Mas from the Spanish team and Benat Txoperena (Murias Taldea). The sprint teams decided to let them go and at the 92km mark, they were 1.45 ahead. However, the big teams were unwilling to let them get more than that and after 116km of racing, the advantage had been brought down to just 1.05. When Bernas beat Txoperena and Mas in the first intermediate sprint at the 123km mark, it was even down to just 48 seconds. With the short advantage, it was possible for riders to bridge across and first Micael Isidoro (Louletano) managed to do so. Later David de la Fuente (Efapel) also joined the action and the quintet were still 45 seconds after 142km of racing. The 5 escapees fought hard to maintain a gap of around 35 seconds as they crossed the finish line to start their lap of the 27km finishing circuit. In the peloton, it was LA Antarte working hard but they failed to bring back the move which was still 40 seconds ahead at the 159km mark. That was the signal for Malori and Castroviejo to make their surprise move and after 151km of racing, they caught the leaders which had a 35-second advantage. It now developed into a fierce battle, with the gap hovering around 35 seconds for the next 20km. With 4km to go, the gap was still 19 seconds but one kilometre later, it had come down to 10 seconds. Passing the flamme rouge, the group was caught and it was Greipel who came out on top in the sprint.